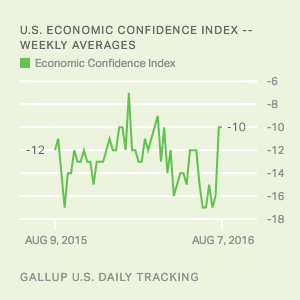 WASHINGTON, D.C. -- Americans' confidence in the economy remains stable, with the Gallup U.S. Economic Confidence Index averaging -12 for the week ending Aug. 28. This is the index's third consecutive week at this level. 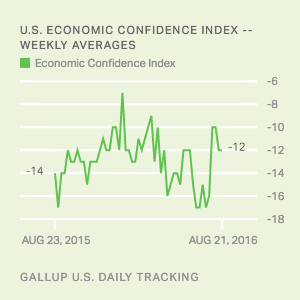 The index has remained relatively calm since mid-summer 2015, after declining from +5 in January 2015. The average weekly index over the past year has been -12, equal to last week's score. However, the index has reached a standstill over the past month. 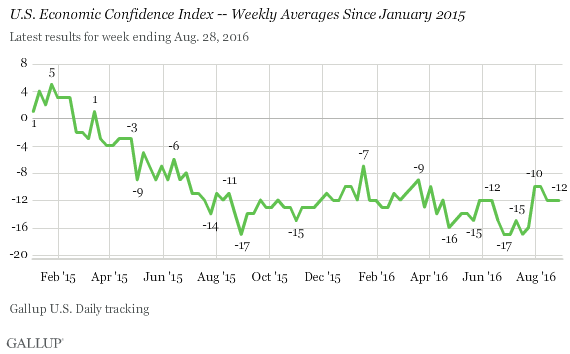 It hit -10 in late July after the Democratic convention and has remained near this level since then. Interestingly, this stability aligns with unusual calm for the U.S. stock market, typically a fountain of volatility. The Standard & Poor's 500 index recently logged its least volatile 30-day period (that is, the smallest day-to-day change in prices) in more than two decades. 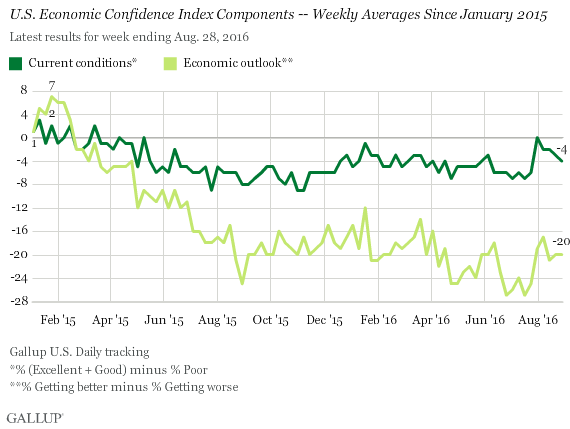 The current conditions score averaged -4 last week, reflecting 26% of Americans saying current economic conditions are "excellent" or "good" and 30% saying they are "poor." The economic outlook component averaged -20, reflecting 38% of Americans saying the economy is "getting better" and 58% saying it is "getting worse." Results for this Gallup poll are based on telephone interviews conducted Aug. 22-28, 2016, on the Gallup U.S. Daily survey, with a random sample of 3,456 adults, aged 18 and older, living in all 50 U.S. states and the District of Columbia. For results based on the total sample of national adults, the margin of sampling error is ±2 percentage points at the 95% confidence level. All reported margins of sampling error include computed design effects for weighting.